What a sweet gift! Right now these Lucky Penny Keychain | Father's Day Gift Idea $5.99 (Retail $12.99). 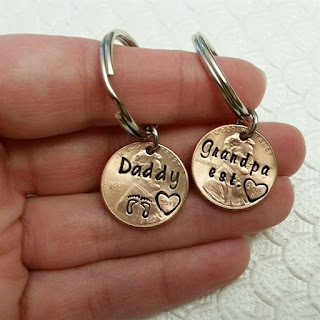 This hand stamped lucky penny keychain is the perfect gift for a daddy or grandpa for Father's Day. Choose from 4 different fonts and multiple styles! $2.49 for the first item and $0.99 for each additional item. US only. Ships no later than Mon, May 7.